If you are feeling the need to change your attitude about life, then it might be time to look at what you are hoping to achieve and what your dreams are. Making plans for your future is key to living a life that fulfils your own needs and desires, after all you only have one chance for a happy life, make the most of it while you can. It is about not having regrets, not wishing that you had done something differently, living life with intention and not just existing. The first step that you must take is admitting to yourself you are looking to change, how you view yourself and others around you, what is it that you are looking to address. Your attitude is your choice, no one forces an attitude on to you and if you choose a negative attitude, then you are not going to see the positives that can and will happen if you take a different standpoint. Sometimes it is difficult to have a positive outlook on life; however, the more positive you are the more likely that you will have a positive effect on those around you. If you have a negative outlook this can spread just as quickly, but it lowers the mood and it can make life more difficult to live. A lot of time, it is about accepting who you are, not comparing yourself to others and what they have and you don’t. If you want something for yourself, asking if it is something, you need rather than a status symbol is important, because at the end of the day this isn’t going to make you happy. This is perhaps the most difficult of all things to change and adapt, we all have goals and dreams but it is those people who live life with intention that act upon those dreams, they make plans to live life in a way that will benefit them and the people around them, they don’t let life just pass them by. This is how I want to live, I have hopes and dreams but to make them happen I have to live with intention, I have to plan and act on those plans to see a positive move in the right direction. No longer am I going to sit and let life pass me by, I am going to start living the life I want, with my dreams and goals in place and actively moving towards them instead of hoping that they will happen without the hard work and determination on my part. I am choosing to put what I want and need at the forefront of my life, I am choosing the person that is happy and healthy and has less stress in my life. I am also choosing that I am going to look on the positive side of things rather than the negative, this negative living has brought me to a sad place, one where depression and weight gain has controlled me for too long. I know the road that I am choosing for my life, my career and me, is not an easy one and to achieve what I want from life will mean hard work, but I am ready for that challenge. I am ready to take on the world and to achieve my dreams, but in doing so I am not going to forget what makes me happy, to understand that a positive attitude can achieve more and to move forward with my life. Therefore, I am moving forward with my life and taking control with a positive attitude, fulfilling my dreams and living an intentional life. Here here! It’s not easy but it’s important. Lets keep at Sharon. And then when we slip get up and try again, and again and again until we make it. Loved this!!! I just wrote on this subject a couple weeks ago and write on it fairly often. I don’t think we can get too much positive input. 🙂 I’ve always said “Life is what we make of it – always has been and always will BE” and we are what we surround ourselves with. Our daughter says I’m TOO upbeat and that I have sunshine coming out of my behind 24/7…that isn’t quite true. But I DO try to be positive 🙂 Loved this post! I want to hug you and cheer you on. What a great post. Keep at it. The last line is my very favorite. So glad to have found you at Equipping Godly Women. Would love for you to link up this post at #JoyHopeLive It is so inspiring to see others living an intentional life and pursuing their dreams. I so agree with the comments from others and hope you realise you are not alone. I, too, have my own demons to overcome. Look forward to hear how you progress. Sharon, I love this post. It is exactly what I needed to hear today. I am actually at a point in my live where I am evaluating many things. 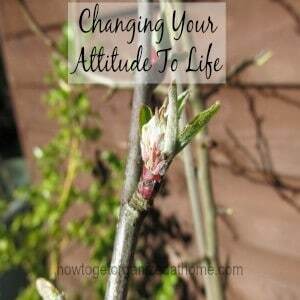 I have a BAD attitude about certain things and I am trying to change that. It is not easy. Yes! Attitude is SO important! Everything I’ve been hearing lately says what a difference it can make!